Today, Microsoft has launched the next version of their popular productivity suite, Office 365 Home Premium. 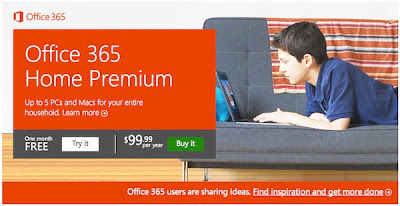 Unlike previous versions of Office, Office 365 Home Premium allows you to install Office 365 on Windows PCs and Macs for a combined total of five installs. Since Office 365 is a subscription service, you have to renew your subscription plan. 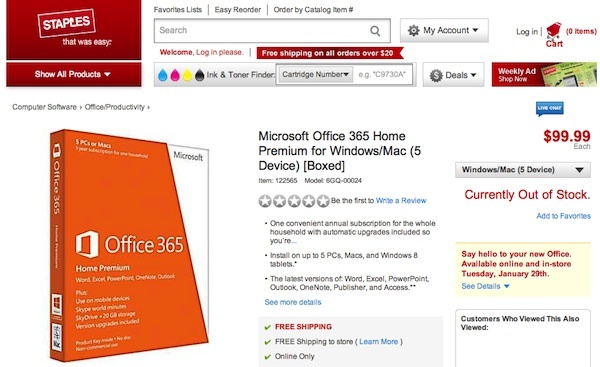 Microsoft is offering Office 365 for $9.99/month or $99.99/year. I'm planning on buying the annual subscription. Windows users will get access to the Office 2013 software that has also gone live today for business customers. If you are installing Office on your Mac, you will get Microsoft Office: Mac 2011, the latest version of Office for Mac OS X. For more information, and to purchase a subscription, visit the Microsoft Office website. Last night I put up a post that I had found Office 365 Home Premium on Staples website. 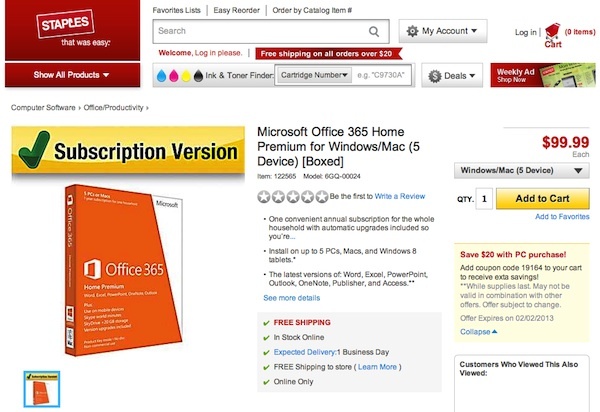 I stumbled across it looking for prices on the Mac edition of Microsoft Office. As you can see from the photo above, Office 365 Home Premium for Windows/Mac is now up, live, and ready for purchase. Unlike other retail box and download versions of Microsoft Office, Office 365 is a subscription service. That means you will be able to use the latest version of the Office software on up to 5 Macs or Windows PCs, that's the cool part, but you have to pay an annual subscription maintenance fee of $100 annually. That's the not-so-cool-but-kinda-worth-it part. I need to install Office, specifically PowerPoint, my kids Compaq laptop that they use for school. I also need to install Office on my Windows 8 Pro box, so I'm excited about this new version of Office. I get to install/upgrade Office on two PCs, with Outlook, for less than the price of one Office 2010 Home and Business license that I was looking at a few days ago. Sound good? What do you think? I've always been a firm believer of running backups your important documents and other data like photos, music, and videos. Over the years, Apple has done a good job enhancing iCloud to automatically take care of this for you on the iPhone, iPad, and iPod touch. With last night's little iOS 6.1 upgrade disaster, knowing that I had a recent backup of my iPhone meant that I was only going to have to deal with the reloading my backup and not have to worry about lost photos, text messages, and all the rest. 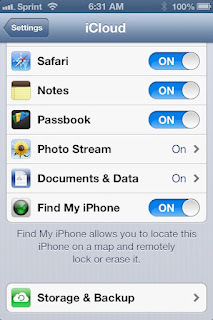 Here are a few quick steps to make sure you have iCloud backups turned on and how to run an immediate backup if you want to - like just before an iOS upgrade. Step 1: To get started, tap on Settings from the Home screen. 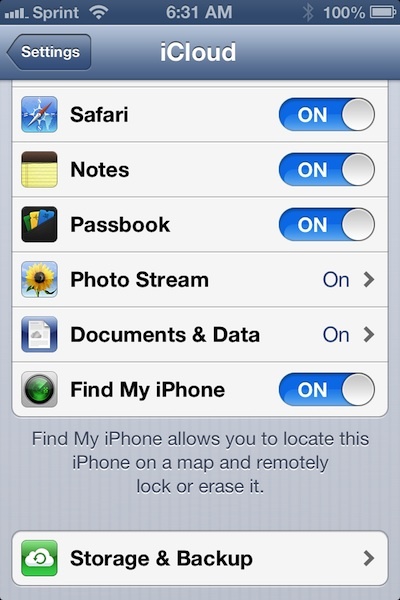 Step 2: Tap on iCloud on the Settings page. Step 3: Sign in to your iCloud account if you haven't already done so. 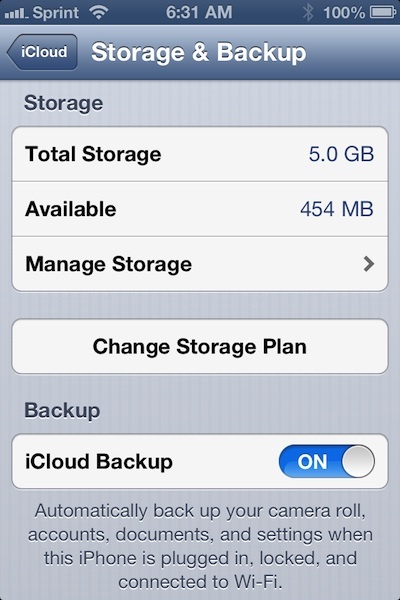 Step 4: Scroll down to the bottom of the iCloud page, and tap 'Storage & Backup'. Step 5: Near the bottom of the page, set the 'iCloud Backup' option to 'ON'. 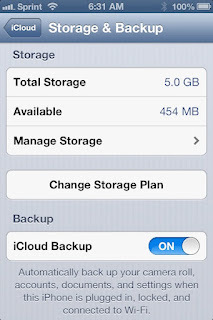 Step 6: Tap the 'Back Up Now' button at the bottom of the page to start a backup immediately. 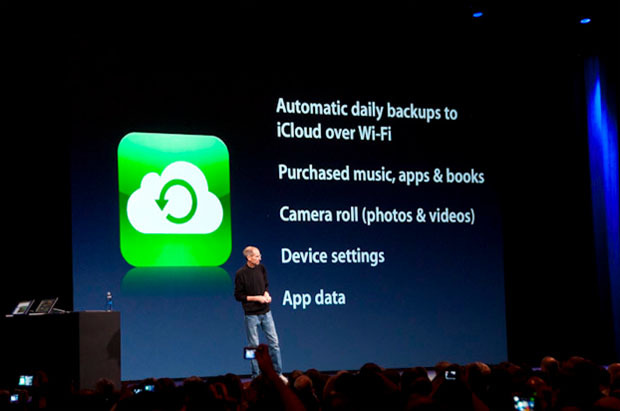 Bonus Points: At the very bottom of the 'Storage & Backup' page, will be a message telling you when the last time a successful iCloud backup was completed. 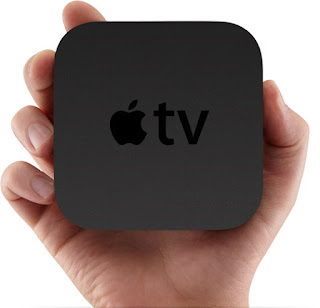 Along side the iOS 6.1 upgrade released today, Apple also rolled out Update 5.2 for current model Apple TV boxes. 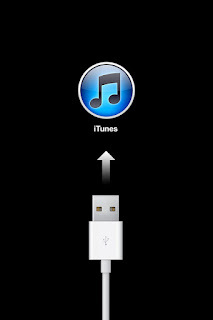 • iTunes in the Cloud: Brows and play your purchased iTunes music directly from iCloud. 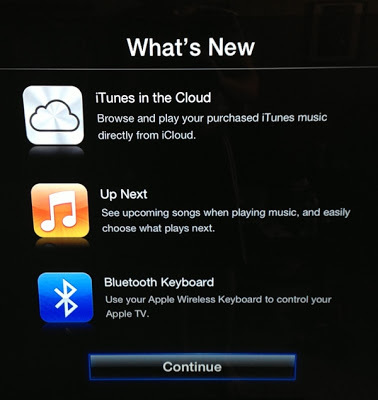 • Up Next: See upcoming songs when playing music, and easily choose what plays next. • Bluetooth Keyboard: Use your Apple Wireless Keyboard to control your Apple TV. According to an article that appeared in today's Wall Street Journal, Apple is rumored to be working on a lower cost version of their popular iPhone smartphone. "Apple is working on a lower-end iPhone, according to people briefed on the matter, a big shift in corporate strategy as its supremacy in smartphones has slipped" reports the Journal. We've heard rumors of cheaper iPhones before along side rumors of an "iPhone mini", however, it seems that this time around, Apple is taking a closer look at finally selling a high and low-end iPhone. Up until now, Apple has favored keeping around the previous two years models as their less expensive purchasing options. 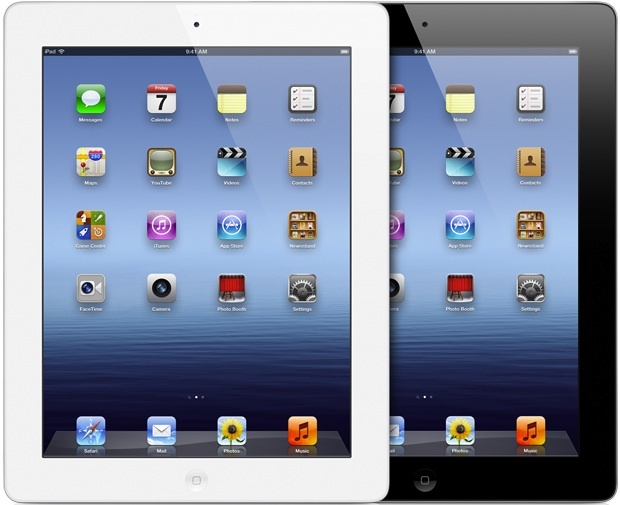 Here in the United States, customers typically purchase wireless carrier subsidized phones. 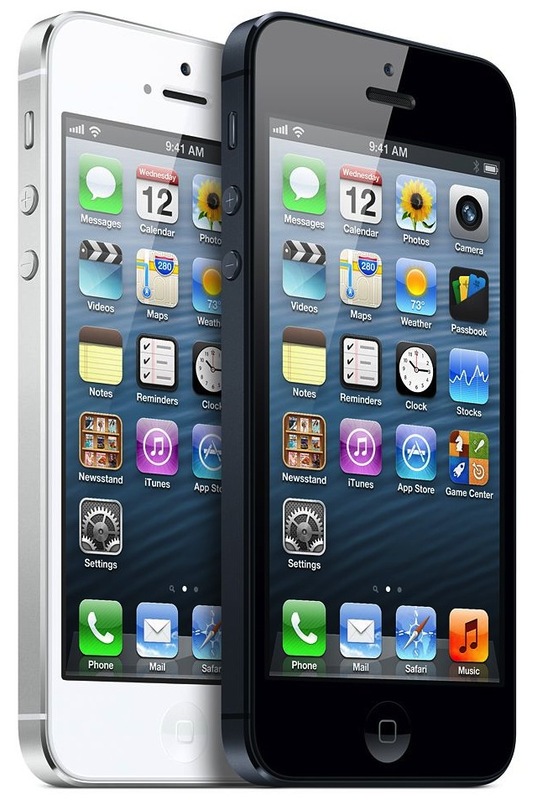 That means, that the newest iPhone, the iPhone 5, starts at $199, last year's iPhone 4S is $99, and the two-year old iPhone 4 is now free. These prices all require that you purchase a 2-year service agreement. 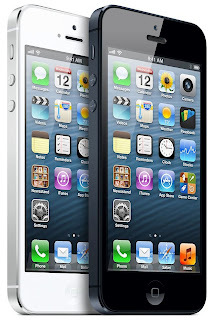 If you chose to purchase an iPhone without a service contract, a 16GB iPhone 5 will cost you $649, a 16GB iPhone 4S will cost you $549, and an 8GB iPhone 4 can be had for the low-low price of $450. Not exactly "cost effective." Now, factor in that in many other countries, wireless carriers do not subsidize the purchase cost of smartphones. Customers have to pay the full price up front, but have the option of changing carriers without the hassle of early termination fees and other lock in tactics that U.S. carriers use to keep people tied to their service. Suddenly those prices look insane for customers to purchase with the current global economic situation. Making matters worse for Apple, Samsung has had an amazing year selling their Galaxy-line of smartphones in China and emerging markets. 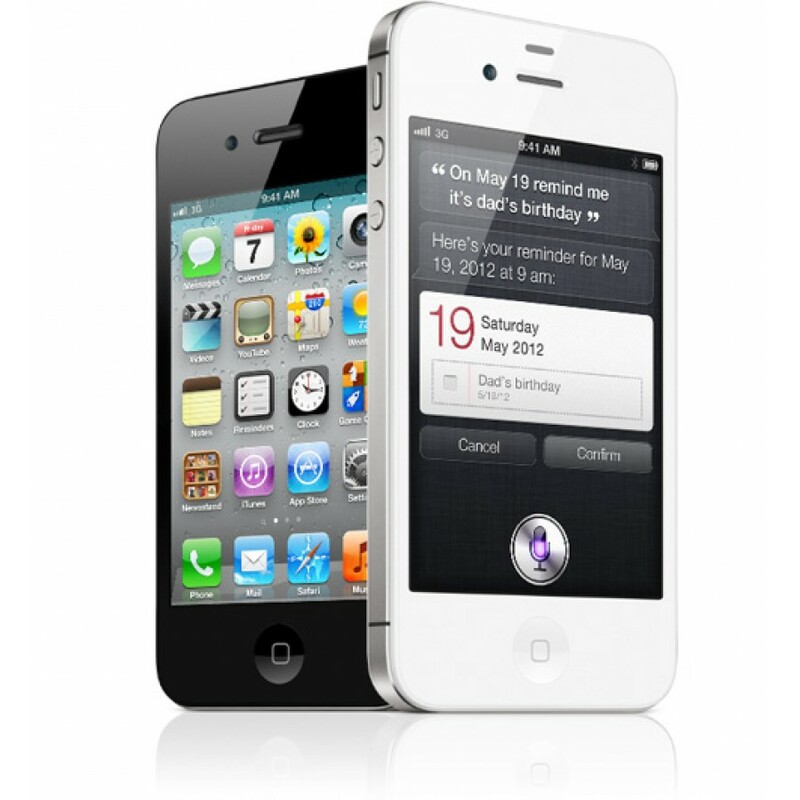 At the end of 2012, Samsung was estimated to have about 31% of the worldwide smartphone market compared to Apple's 14.6%. 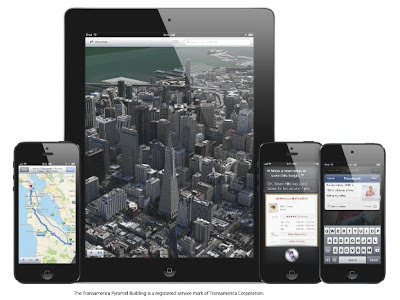 To put a finer point on it; the iPhone generates about 48% of Apple's total annual revenue. Any perceived slowing or decline in Apple's global share is likely to send investors running for cover. "Apple has been considering a less-expensive iPhone since at least 2009, viewing it as a way to grab market share and introduce people to the brand, said people familiar with the efforts. Before the launch of the iPhone 4 in mid-2010, the company developed designs for cheaper phones that were very similar to the iPhone at the time but had a less expensive back and sides, one of the people said."